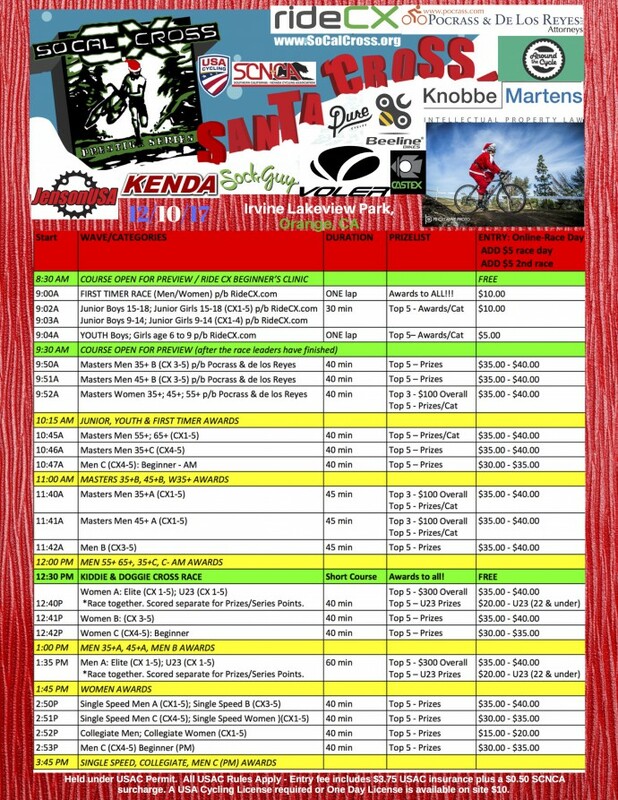 SoCalCross SCPS 14: Santa CX in the OC! 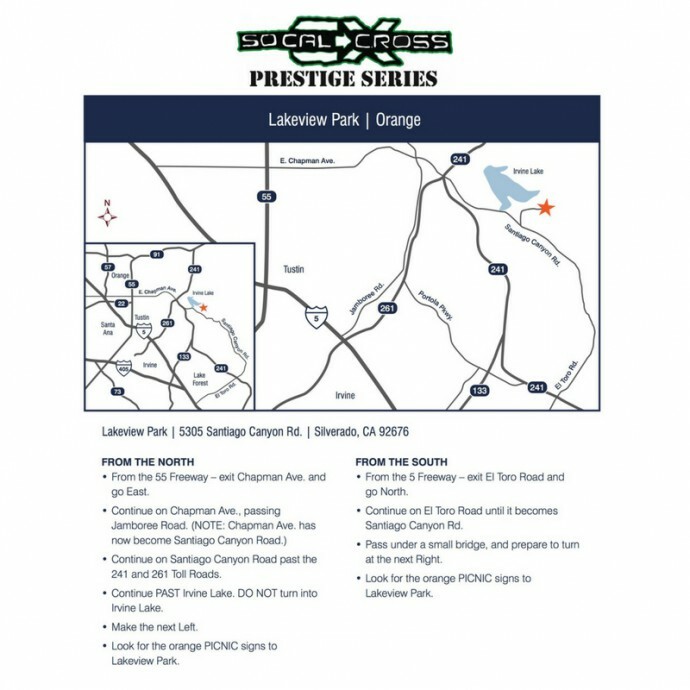 SoCalCross returns to the OC just in time for the Holidays! 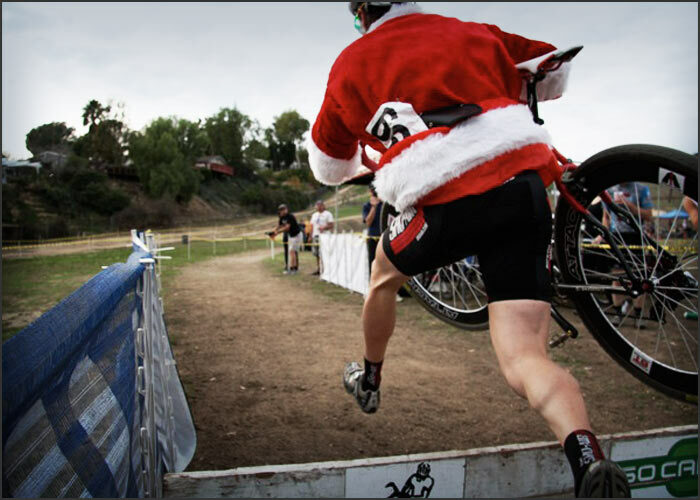 Santa Cross holiday themed racing returns to Irvine Lakeview Park – Baja Beach Club for Santa CX in the OC! Holiday cheer in the EXPO by Beeline Bikes providing Tech Support/ Around the Cycle & Raleigh Santa Monica CX Demo Rentals available, Jenson USA, Kenda USA, Voler Apparel, Pedal or Die Racing, Troupe Racing Coffee Bar, Taco Bar by Tacos Tiberon and Kiddos Kettle Corn featured in the expo! Santa Cross OC is also a USA Cycling sanctioned race and opportunity for category upgrades and ranking points needed to compete at the USA Cycling CX National Championships in Reno, NV Jan 9-14, 2018 ** Entry fees increase December 15th! 2018 Annual license is required and on sale online at USAcycling.org. One Day license available race day for new & Cat 5 riders. Race Day Registration is available starting at 7:30AM then 2 hours before each race start. 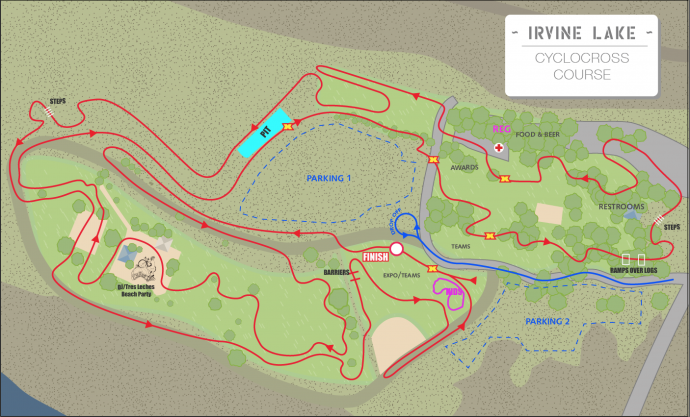 Cyclocross is a mixed terrain course using pavement, path, dirt and grass. Obstacles barriers and steps, loose sections of dirt and sand will challenge to athletes and force them off of their bikes. For this park, the course is 50% dirt and 40% grass. 10% gravel/sand.